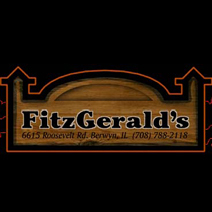 FitzGerald's 37th Annual American Music Festival - Jun 29, 2018 - Why Berwyn? - Why Berwyn? Website: Get your tickets HERE! 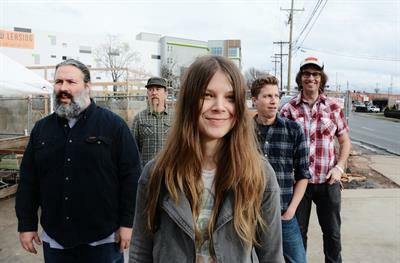 Americana and roots music fans will find a full menu of talent at FitzGerald's 37th Annual American Music Festival brought to you by FitzGerald's, 93XRT and Miller Lite. The 4-day event (June 29-30, July 1 & July 3), the longest running festival of its kind in the Chicago area, features more than 50 acts from Chicago and around the country. Food will be provided by Tom "Festival" Cimms who makes his specialties exclusively for the festival—a delicious mix of classic American and New Orleans favorites. You want it, we got it —blues, rock, pop, zydeco, soul, funk, jazz, country and folk. Headliners include Nick Lowe with Lost Straitjackets, James McMurtry, Joe Ely Band, Eric Lindell, Kelly Willis, Marcia Ball Band, C.J. 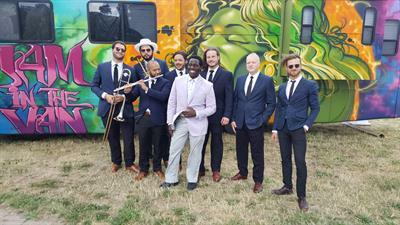 Chenier & the Red Hot Louisiana Band and Blackfoot Gypsies. The Festival takes place rain or shine on three stages - club, tent and SideBar. Hours are 4:30PM to 2:00AM June 29, 1:00PM to 2:00AM on June 30, 1:00PM to 1:00AM on July 1 and 4:30PM to 2:00AM on July 3. Advance tickets, $40 (June 29-30) and $50 (July 1 & 3). Tickets are on sale now and are available at TicketWeb and in person at FitzGerald's. Each day of the fest, a $10 discount will be given the first hour of opening. A 4-day pass for $140 is available at TicketWeb only (lanyard picked up at will call during fest). Click HERE to purchase tickets. For more information on the festival, click HERE or visit Facebook. Children 12 and under are welcome with a parent until 10:00PM. Tickets are $10; no children's tickets will be sold in advance. IN THE TENT: Salty Dogs (5pm), Brian Johannesen (6:30pm), Bob Schneider (8:30pm), James McMurtry (10:30pm). IN THE CLUB: Alice Drinks the Kool Aid (5:30pm), The Band of Heathens (7pm), Marcella & Her Lovers (8:30pm), Sam Lewis (10pm), Eric Lindell (11:45pm). IN THE SIDEBAR: Jenny Bienemann & Friends (6pm), Brett Newski (8pm), Curtis McMurtry (9:30pm), Bitters (11pm). IN THE TENT: Devil in a Woodpile (1:30pm), Vanessa Davis (3pm), Ruby Boots (4:45pm), The Ike Reilly Assassination (6:30pm), Kelly Willis (8:30pm), Joe Ely Band (10:15pm). IN THE CLUB: Katie Guillen & the Girls (2:30pm), Michelle Malone (4:15pm), Sarah Shook & the Disarmers (6pm), Jon Dee Graham (7:45pm), Kevin Gordon Band (9:30pm), Flirting with Time: A Tribute to Tom Petty (11:15pm). IN THE SIDEBAR: The Northsiders Barbershop Quartet (4:30pm), Blue Ribbon Glee Club (6pm), Wild Skies (7:30pm), Crooked Love (9pm), JP Cyr & the Midnightmen (10:30pm). IN THE TENT: Josefina (1:30pm), Expo ’76 (3:15pm), Geno Delafose & French Rockin’ Boogie (5pm), Archie Bell (7pm), C.J. Chenier & the Red Hot Louisiana Band (8:30pm), Marcia Ball Band (10:30pm). IN THE CLUB: Al Scorch (2:30pm), Zephaniah OHora (4pm), Miles Nielsen & the Rusted Hearts (5:30pm), Sarah Borges & the Broken Singles (7:15pm), John Moreland (9pm), Banditos (11pm). IN THE SIDEBAR: The Menards (3:15pm), Kevin A. Prchal (4:30pm), Ron Lazzeretti (6:30pm), Bunkertown (7:45pm), Cannonball (9:30pm), The Belevederes (11pm). 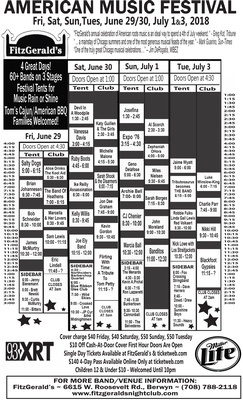 IN THE TENT: Jaime Wyatt (5pm), Tributosaurus becomes The Band (6:15pm), Robbie Fulks, Linda Gail Lewis and Red Volkaert (8:30pm), Nick Lowe with Los Straitjackets (10:30pm). IN THE CLUB: Luke Winslow-King (6pm), Charlie Parr (7:45pm), Nikki Hill (9:30pm), Blackfoot Gypsies (11:15pm). IN THE SIDEBAR: Fox Crossing Stringband (6pm), Dave Herrero (7:15pm), Dowd/Drew (8:45pm), The Sunshine Boys (10pm), The Heavy Sounds (11:30pm). Advance tickets, $40 June 29-30 and $50 July 1 & 3. 4 day pass- $140 is available at TicketWeb only.